It’s our Winter special issue! Discover how to treat canine cough; find out if you should change your dog’s diet to suit the cooler months; and try out our cool wet weather boredom busters. Also in the mag, we feature 19 fur-tastic winter dog coats; tips to keep your dog busy when home alone; and discover how you can help protect shelter pets in need. 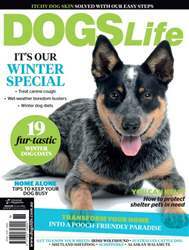 Read all this and more in the July/August issue of Dogs Life magazine.